1) Your costume must be 80% made or altered in order to enter this contest. No bought costumes will be allowed. Made means you made something out of supplies or fabric. Altered means (for example) you took a suit jacket that was too large for you and altered it to fit you better. 2) This contest has a strict limit of 20 entries. Once that limit is reached we will not be able to allow any more entries. If all slots are not filled before the convention, entry forms can be found and returned to the registration desk. 3) If your costume was not made by you then the person that did make the costume must be present at pre-judging. Either the model or the person that made the costume may turn in the entry form; Only one entry form is required. 4) You may enter as a group. Groups cannot be larger than 5 people as our stage cannot accommodate any more than that. If you do enter as a group only one entry form is required for the entire group. 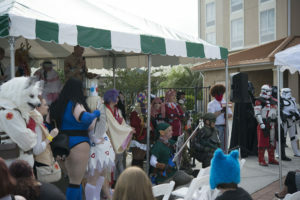 5) A reference photo of your character or characters is required in order to compete and participate in pre-judging. Reference photos will be checked at the front door and presented to the judges before you enter the room. If you do not bring a reference photo of your character(s) you will not be able to compete in this contest. Reference photos can be printed out or on an electronic device. It is crucial to have these photos so the judges can see your likeness to the character(s). Reference photos will be returned to you at the end of the contest if you wish. 6) In order to compete in this contest you must attend pre-judging. Pre-judging will be held on Saturday from 3:00pm until 5:00pm in the Comfort Inn Conference Room (adjacent to the Conference Center). The contest will be held on the same day from 7:00pm until 9:00pm on the main events stage. If you fail to show up for your pre-judging time you will be disqualified from being able to compete in the contest. 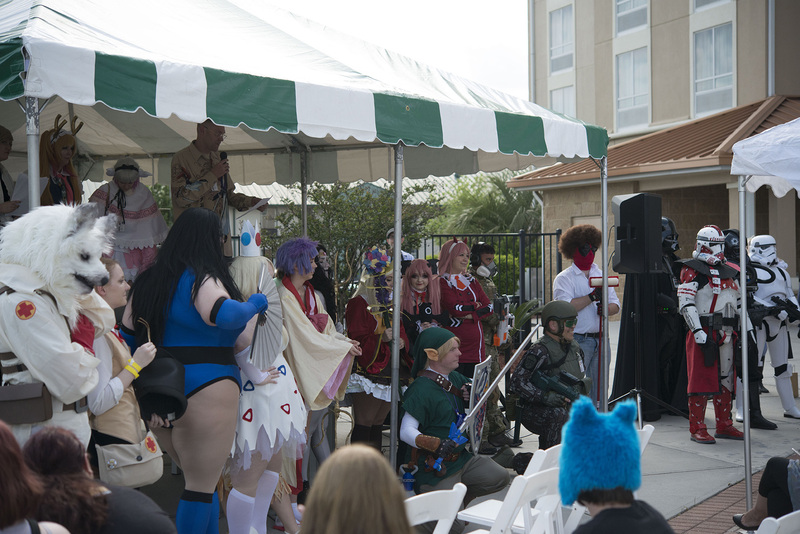 7) You must be a registered attendee, vendor, artist, or staff member to compete in the Tiger Con Costume Contest. All entry forms must be completed before April 12, 2019. After that time (if the entry limit is not reached), entry forms can be found and returned to the registration desk on the day of the contest. At that point entries will be handled on a first come/first serve basis. A winner will be selected from each category, plus Best in Show, Craftsmanship, and Judges Choice. By submitting an entry form, you agree to abide by the above rules.